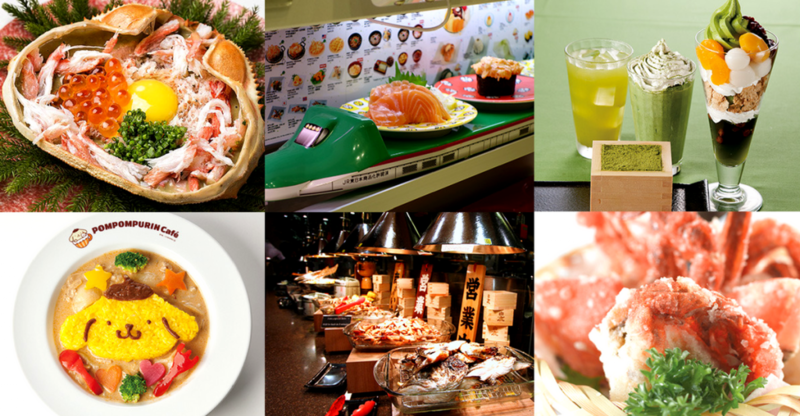 Orchard Central’s "All Things Japanese" Festival Is All About Japan! For the whole month of October (7 Oct – 6 Nov), Orchard Central is going all out to celebrate Japanese culture. Hosting All Things Japanese @ OC 2016, Orchard Central wants you to get into the festivities as well! If you’ve not noticed, Orchard Central is somewhat of a “Little Japan”, and is home to several Japanese food outlets and retail shops. From an all-you-can-eat Japanese buffet to a Pompompurin themed cafe, Orchard Central is the perfect place for a Japan-lover to spend their weekends. We’ve compiled a list of these particular shops, and what you can look forward to when visiting them! Orchard Central is home to UNIQLO‘s first Global Flagship Store in Southeast Asia, and it spans three floors! An interior design eyecandy, UNIQLO has a refreshing and brightly lit in-store design that will make mere browsing feel so much more enjoyable. With its full product line-up (including the latest UNIQLO U Collection!) and a dedicated UT Graphic T-shirt section, UNIQLO Orchard Central is the best place to get great styling inspirations! TOKYU HANDS offers day-to-day necessities as well as creative and unique knick-knacks. From colourful stationery to beauty treats from well-known Japanese labels, TOKYU HANDS is the one-stop shop for all your must-haves! A great place to pick up gifts, especially now that Christmas is around the corner. Check out some interesting products we’ve found at TOKYU HANDS! Getting a gift for a friend who loves having friends over for dinner? Get the Nigiri Sushi Tong, picking up sushi just a whole lot easier. Never waste fallen pieces of sushi again! If you haven’t got a green thumb but you still love the idea of miniature plants around the house, Ceraphyto makes sure that your plant gets the water it needs. Without having to lift a finger, your miniature plant will thrive and brighten up your room! Want to try creating your own Bingsu? Good news for you, TOKYU HANDS has Yuki Yuki ice shavers for you to create icy desserts in the comfort of your own home! Absolutely value for money and quality food Kiseki Japanese Buffet serves up all your Japanese favourites at an amazing $19.80++ for weekday lunch! Head on down to Kiseki Japanese Buffet this month to experience their newest promotion, Mighty Taste of Autumn. Serving up both traditional and Singapore inspired fusion dishes, look out for the Salted Egg Tempura Maki, Salted Egg Seafood Pizza and the Pork Paitan Herbal Hot Pot! Bursting with flavor, The Mighty Taste of Autumn is available until 31 October 2016! We Singaporeans love our Japanese cartoons, and we have a few themed restaurants to prove it. So, it’s no surprise that we have our own POMPOMPURIN café offering Pompompurin-inspired dishes and even character-themed merchandise you can purchase after your meal! Looking for a dish that is bound to fill your appetite? The Coconut Milk Chicken Curry is the perfect dish for you! A warm and hearty dish accompanied with a mix of veggies, this dish is the perfectly balanced meal. A dish worth the trip, Taco Rice In A Cup Of Friendship is not only an amazingly refreshing Mexican inspired dish, it’s a treat for the eyes as well! Caution, you might not have the heart to eat the rice which is shaped like Pompompurin! Looking for something sweet to end your meal? Opt for the Banana and Caramel Pancake! Simple, warm and sweet, this dessert is not too heavy yet will end your meal at POMPOMPURIN Café on the sweetest note! Newly-opened En Sakaba offers traditional Japanese dining and a casual spot to catch up with friends over drinks. With a wide array of tapas, sake and cocktails, this is the perfect spot to unwind after a stressful day at work. Their speciality here? The Jumbo Hotate Yaki and Zuwai Kani Kourayaki are the favourites at this casual dining spot. One thing to look out for at OC this month is the Supermama Popup Store. Not your ordinary run-of-the-mill popup store, Supermama collaborates with local artists and traditional craft facilities in Japan to create Japanese-influenced contemporary giftware. Look out for Kyoto-to’s embroidery purses. Fusing both traditional and contemporary sides of Japan, Kyoto-to explores new ways of promoting Japan’s culture and tradition through its embroidery designs. Orchard Central will also be featuring a range of zakka items from Japanese labels, Matsunoya Zakka and Details Inc (Osaka). For those unacquainted, zakka in Japanese simply means ‘many things’. Expect items that seem to invoke an aura of Japan in the 60s. Spend $100* at Orchard Central and you’ll be rewarded with a HAKOYA bento box! A new design will be released each week, collect the remaining designs of this unique bento boxes that will brighten/cheer up your meal times! So what are you waiting for? Grab your family and friends and head on down to Orchard Central to join in the festivities! Orchard Central is located at 181 Orchard Road, S(238896). Follow them on FACEBOOK & INSTAGRAM for more information.